Dry Eye Disease is influenced by several external and internal RISK factors. ... The EXTERNAL RISK FACTORS can often be distinctly influenced by the patient - which is an important approach for preventive therapy. Event though it is often difficult to remove internal risk factors, they can sometimes be influenced to a certain extent in order to MINIMIZE the negative influences. When the drinking volume is insufficient for the individual in relation to her/his physical activity and the ambient temperatures, a systemic desiccation with low blood volume will also translate into a lower tear volume. Therefore a sufficient ´therapeutical´ refill by drinking of suitable sources of water will also improve the aqueous tear production as reported by Christine PURSLOW and colleagues. Similar improvements may be achieved when the actual diet lacks certain substances that are supposed to be important for ocular surface health. With awareness of the importance of MGD and lipids for Dry Eye Disease, in particular the importance of a higher intake of Omega-3 fatty acids is discussed. When systemic disease or particularly its therapy negatively influences the ocular surface and leads to symptoms of Dry Eye Disease it may make sense to investigate with the help of the respective clinical specialist whether the pharmacological therapy may possibly be modified in this respect. 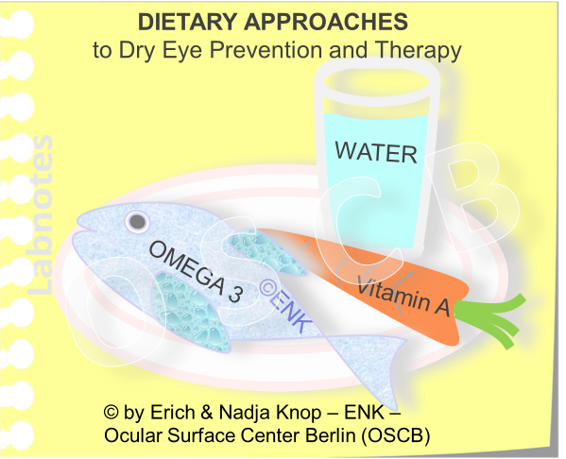 Typical pharmacological classes that are found to promote Dryness of the ocular surface are e.g. estrogen-replacements, anti-androgens, certain retinoic acid derivates, certain anti-depressants, anti-histamins ... as can be reviewed in a great subcommittee report on the epidemiology of Dry Eye Disease of the TFOS DEWS report. To modify therapy for systemic disease will often be difficult because the systemic disease is typically more severe and potentially more life-threatening than the ocular condition ... but still it may be sometimes be possible to find a more suitable therapeutics. External Risk Factors have a significant influence on Dry Eye Disease, apparently particularly on MGD. Therefore is is often very advantages to have a close look at one´s own daily schedule and personal environment in order to identify and remove known negative external risk factors. A desiccating environment is probably the main factor for the induction or progression of Dryness at the Ocular Surface and thus for the development of Dry Eye Disease if this type of environment is chronically present. In line with this - a desiccating environment is a main approach to induce Dry Eye in animal models of the disease. This applies to low humidity, often induced by imperfect air-conditioning, and high wind speed either in combination with air-conditioning or by extra fans in hot seasons. Both can be improved if it is known to cause a Dry Eye Condition. Another critical issue is a low blink rate that typically occurs in visual tasks with high attention to and concentration on a computer screen of any kind. Then the blink rate can become so low, that the inter-blink period is longer than the stability of the pre-ocular tear film - even when the film is primarily normal. This puts a stress on a, probably primarily normal, tear film that exceeds its physiological capacities and thus leads to accumulation of effective evaporation and dryness over time, before the tear film is refreshed by a new blink. This condition can typically be amplified by screen work in air-conditioned, low humidity and higher wind speed environments and leads to a Dry Eye condition that is for obvious reasoonsn termed as ´Office Eye´. This term may be misleading, nowadays in modern time where computer screens including those of smartphones have become a universal and inevitable part of our daily lives ... but the same risk factors apply here in principle. Advisable THERAPY options would be, e.g. frequently blink exercise is recommended. There are even computer tools and smartphone apps that alarm the user from time to time and remind and/ or instruct her or him to perform such interruptions and how to to blink exercises. Improvement of a Low blink frequency is discussed a an important approach to avoid or to improve Dry Eye Conditions in Meibomian Gland Dysfunction (MGD). The rationale behind this is the fact that the action of the lid muscles during the blink appears as the main force that drives the secreted oil actually out of the gland orifice. Low blink rate with a lack of delivery, on the other hand, may promote the development of stasis of oil and development of gland obstruction - please see the section for MGD. Contact lens wear is known to have higher requirements for the tear film and particularly for the available tear volume. In this respect, contact lenses are a ´stress factor´ for the ocular surface environment. On the other hand, contact lenses appear to have so many advantages in daily life, that they are widely used as detailed in the section for ´contact lenses´. Contact lens wear is a general stress factor for the Ocular Surface and Tear Film. CL e.g. increase the frictional forces during the normal eye movements and blinking. Therefore CL wear has higher requirements for tear volume and (lubricative) quality than required in non-CL-wearers. Since contact lenses are a ´stress factor´ for the tear film it is not much of a surprise, that Non-Obvious MGD, an in-apparent gland obstruction with borderline-normal tear film, was first described in apparently normal individuals, who developed signs of dry eye with contact lens intolerance only after fitting of a lens. The explanation is that contact lenses have higher requirements for tear volume and quality and that the tear film, which was ´just good enough´ under normal conditions proved insufficient when a contact lens required more of it. Contact lens wear may also increase the rate of aqueous evaporation through the split of the tear fluid in a layer behind and a layer in front of the lens. In conclusion, for a borderline normal eye or for individuals who have a hight exposure of internal or external Risk Factors it is probably of advantage to avoid a contact lens. On the other hand, in severe dry eye a special large ´scleral contact lens´ can be used as a therapeutic tool because it preserves the available tears underneath of a vault of the lens the ocular surface against mechanical friction.